An ardent supporter of liberal causes and active as a Trustee and Board member for many worthy charitable endeavors and foundations as well as being an Honorary Mayor of Sherman Oaks, California, Marsha is a genuine humanitarian as well as a star of Hollywood’s Golden Age. During her years at the studios, Marsha was a popular subject for the constant stream of fashion photographs sent to newspapers and magazines to publicize contract players and their films. Those photos included designs created for Marsha by some of Hollywood’s legendary talents such as Edith Head, Irene and Adrian. Luckily, Marsha’s own interest in fashion prompted her to keep copies of those many shots and decades later she authored a coffee table tome of anecdotal reminiscences and fashion advice, “The Way We Wore.” The book is considered an essential reference source throughout the fashion industry today. Between films, Marsha worked on radio and early television where, during the period now known as Television’s Golden Age, she appeared in more dramas than any other movie star. In fact, she was the first to do Shakespeare on American TV when she appeared as Viola in “Twelfth Night.” Guest appearances on “Matlock,”“Star Trek” and “Murder, She Wrote” continued her TV work over the years. Broadway beckoned and Marsha conquered it when she made her debut in 1948’s “Joy to the World.” She followed with Shaw’s “The Devil’s Disciple” (which landed her on the cover of “Life” magazine.) Her stage co-stars include Alfred Drake, Maurice Evans, Anthony Quinn, Vincent Price and surprisingly, Johnny Carson (in “Tunnel of Love.”) Her musical gifts allowed her to tour in “The King and I,” “State Fair” and “Meet Me in St. Louis.” In fact, writing songs is a favorite preoccupation with 50 tunes to her credit. Like so many stars, writers and directors, Marsha Hunt’s career was stalled during a dark period in Hollywood history when fear of Communist influences in the entertainment sphere lead to the infamous “blacklist.” Marsha had done nothing more than speak out against the red hunts, but in those fearful years, that was enough to make it difficult for her to get screen and TV work during the 1950s. A truly admirable person, she stood by her principals. Married to her second husband, Robert Presnell Jr., for forty years until his death in 1986, Marsha’s personal life has been rich and rewarding. Her 90th birthday was celebrated with a day long retrospective of her films broadcast on TV’s Turner Classic Movies network. 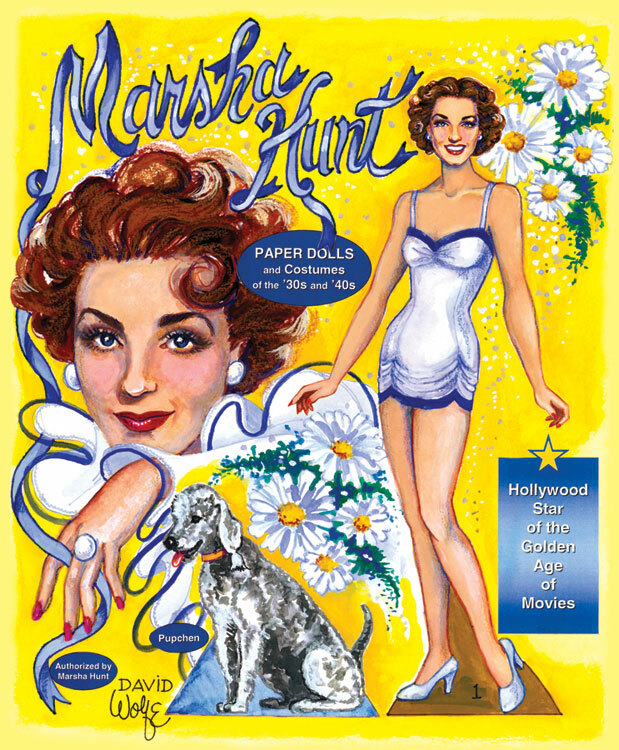 A frequent guest of honor at Paper Doll events, the fashion-conscious star has been the subject of several paper dolls including this authorized edition.